The scapula (shoulder blade) is a large, important bone with a complex structure that helps make up the shoulder joint. The scapula has many important muscles attached to it. The muscles are responsible for stabilizing the shoulder joint, as well as for providing arm movement. When one or more of the muscle-tendon units no longer work in unison, it causes a break in scapular movement and may lead to scapular dyskinesis (abnormal movement). This type of condition is relatively common. In severe cases of nerve or muscle damage, which fortunately are uncommon, scapular winging may occur. A winged scapula can at times be quite easy to diagnose since the scapula is protruding out and away from the back. At other times, however, the diagnosis may be more subtle and difficult to make. Dr. Peter Millett is an expert on these types of shoulder disorders and sees patients from around the country and internationally for the treatment of winging of the scapula. Scapular winging, also know as a winged scapula, can be a primary diagnosis when caused from a nerve or muscle injury; alternatively, it can be a secondary diagnosis when it becomes a symptom of another shoulder condition. Scapular winging is marked by the shoulder blade protruding out on the back instead of lying flat (Figure 1). Scapular dyskinesis, where the shoulder blade moves abnormally, is common and is usually due to mild muscle imbalances. Scapular dyskinesis may be caused by poor posture, shoulder injury, overuse in sports, or injury to the scapular muscles, and it is usually responsive to non-operative treatment with physical therapy and muscle re-training. Scapular winging on the other hand, while more disabling, is fortunately quite rare and is due to more severe injury to the muscles that control the scapula or to the nerves that supply the muscles. Winging is usually treated non-surgically as it can frequently resolve or heal with time, but when it persists, surgery may be needed to restore shoulder function. Scapular winging may cause additional symptoms along with the physical protruding of the shoulder blade from the back. Patients with this condition should visit a shoulder specialist. Patients typically report pain, weakness, limited shoulder elevation, decreased range of motion, or deformity. Diagnosis of scapular winging begins with a thorough physical examination and medical review by a shoulder doctor. The examination usually reveals the angle of scapular winging with shoulder motions. If the entire brachial plexus is involved, patients may also show weakness of the biceps and deltoid muscles. Isolated long thoracic nerve injury with resultant dysfunction of the serratus anterior muscle is the most common type. Spinal accessory nerve palsy with dysfunction of the trapezius muscle is often seen with penetrating trauma or as an adverse outcome of another surgical procedure. Standard x-rays, an MRI of the shoulder, neck, or scapula and EMG (electrical) testing of affected nerves and muscles should be performed to confirm the diagnosis in most cases. The long thoracic nerve innervates the serratus anterior muscle (Figure 2). Injury to the this nerve in turn causes weakness of the serratus anterior muscle, which can manifest clinically as scapular winging. 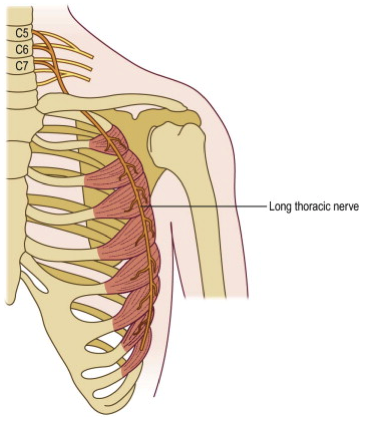 Long thoracic nerve injury can occur acutely from a blow to the shoulder, or with activities involving chronic repetitive traction on the nerve (e.g., tennis, swimming, baseball). Symptoms may include diffuse shoulder or neck pain which worsens with overhead activities. 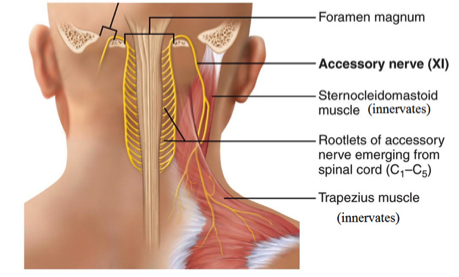 The spinal accessory nerve innervates the trapezius muscle (Figure 3). Injury to the spinal accessory nerve can occur with trapezius trauma or shoulder dislocation. Certain previous surgeries, including radical neck dissection, carotid endarterectomy, and cervical node biopsy are additional potential sources of injury. Patients usually have generalized shoulder pain and weakness. The shoulders may be asymmetrical on visual inspection. The affected shoulder appears to sag and the patient is unable to shrug the shoulder toward the ear. Associated weakness of forward arm elevation is common. With chronic injury, atrophy (chronic muscle wasting) of the trapezius may occur. 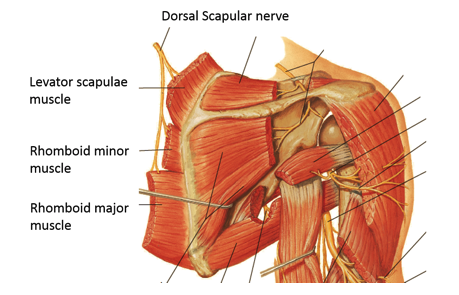 The dorsal scapular nerve innervates the rhomboid major and minor muscles (Figure 4). Dorsal scapular nerve entrapment is an uncommon and frequently under-recognized cause of neck and shoulder pain. The scapular winging may be subtle, and the symptoms are easily mistaken for other problems. Causes may include repetitive overhead activity and trauma such as anterior shoulder dislocation or “whiplash” neck injury. (Click to Enlarge) Figure 5: Pectoralis major tendon transfer for winged scapula. This is performed in cases of serratus anterior muscle dysfunction. The functional pectoralis major tendon is transferred to the approximate insertion site of the dysfunctional serratus anterior muscle. In this way, the pectoralis major muscle takes on the job of the serratus anterior muscle, thus preventing scapular winging. Are you experiencing scapular winging? Treatment of scapular winging depends on the severity of symptoms and cause of the condition. A shoulder specialist may prescribe a variety of common treatment options if the condition is not too severe. Non-surgical measures often include ice, heat, medications, and a focused physical therapy program. Physical therapy is designed to strengthen the serratus anterior, the rhomboids, and the trapezius muscles and to return full range of motion. Frequently nerves can and do recover spontaneously, therefore appropriate time should be allowed for this to occur. Pectoralis major tendon transfer for scapular winging due to long thoracic nerve palsy or serratus anterior dysfunction (Figure 5). Eden Lange procedure and its modifications – for scapular winging due to spinal accessory nerve palsy and trapezius muscle dysfunction. (Figure 6). To learn more about scapular winging, please contact the office of Dr. Peter Millett.